Not so many moons ago I met a Vietnamese lady when I was on a brief stopover in Singapore. We were both taking advantage of the hotel pool and as we pretty much had the pool to ourselves we struck up conversation. The topic of food naturally came up and I think she could sense my longing to experience the culinary treats of her native homeland. She spoke about her favourite Vietnamese spring rolls and I tried hard to take down a mental note of all the ingredients she was spinning off. Later that day when I returned to my room I found a couple of hand written notes detailing her Vietnamese spring rolls, or Cha Gio to be precise. I was really touched that she had gone to the effort of writing it down and slipping it under my door. Life is clearly full of wonderful surprises. Upon returning to London I sent her an email thanking her for the recipe and promising that I would try it out very soon. 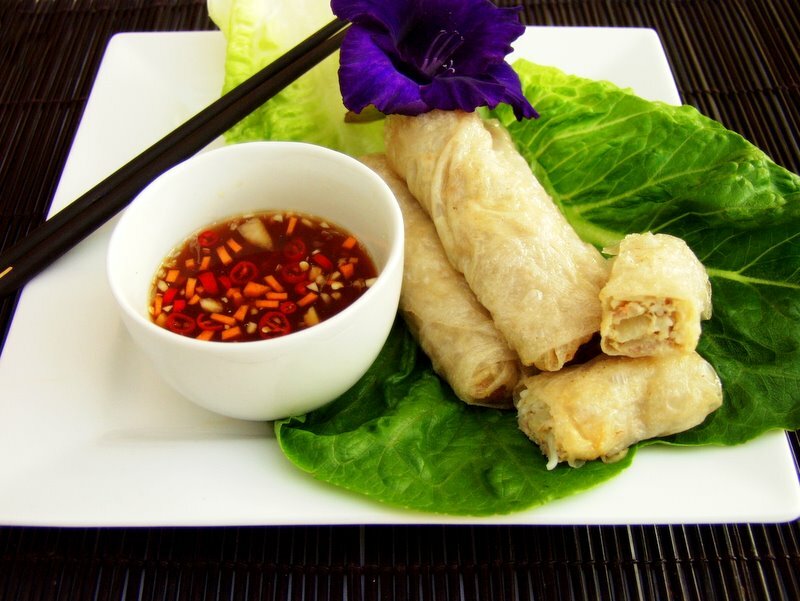 She then replied with a further recipe for the dipping sauce, known as Nuoc Cham, which would compliment the spring rolls to perfection. So that brings me to today. Making spring rolls, much like making tortellini, is definitely a communal affair so I rallied the troops…..well slight exaggeration, I rallied a newlywed friend of mine who was up for the challenge. They were really good fun to make although there are definitely some tips to take on board, before embarking. 1. Don’t wet the rice paper too much. Literally place it in a bowl of warm water and submerge it and spin it once and then remove it. If you leave it in the water for too long, it becomes very difficult and limp to handle. 2. There is definitely a skill in folding the rolls. Keep them tightly folded and secure and after the first turn tuck in both ends before proceeding to roll the rice paper further. 3. Don’t be greedy and overfill. Less is more, definitely comes to mind when rolling these beauties. 4. The oil must be very hot BUT on a low heat, that’s the trick folks. Place a crumb in the oil and if it fizzles, then the oil is ready. 5. The pork meat will cook beautifully, don’t worry that it won’t. 3-4 minutes and the spring roll will be ready. 6. Steaming is also an option – it will take 20 minutes, but I thought that I would try the less healthy option of frying for my first attempt. 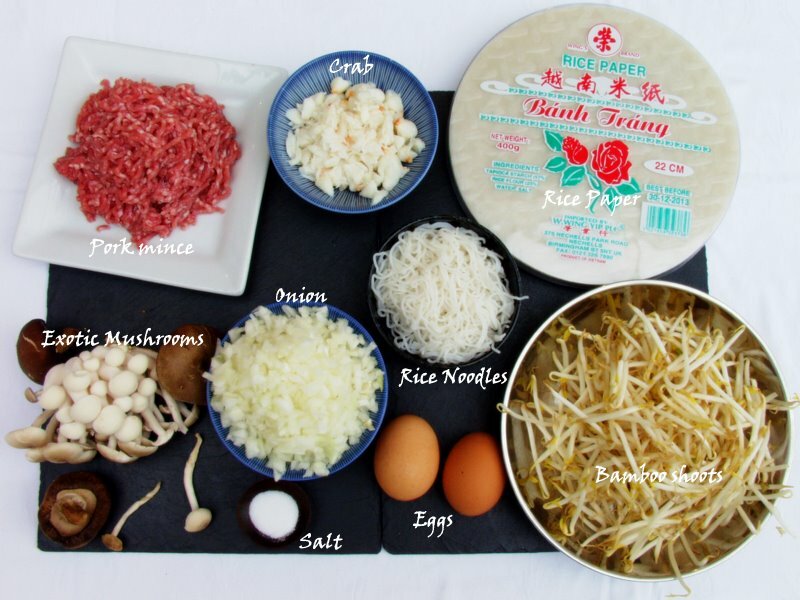 So here are the ingredients for the spring rolls. 1. Finely chop the onion and then combine it with the mince, egg, noodles, crab, mushrooms, beansprouts, carrots (if using them) and salt. 2. If you are going to use carrot then slice thinly into 2cm long straws. 3. If you are using wood ear mushrooms (I could not find them so opted for exotic mushrooms) you will need to soak them for 30 minutes before slicing them into strips. Similarly you may also need to soak your noodles for 20 minutes in cold water before cutting them to 10cm in length. I used Amoy ‘straight to wok’ rice noodles, which do not need any soaking. 4. Place the rice paper into a bowl of warm water for no longer than 5 seconds. Then lay it out onto a flat surface and add a spoonful of the pork/crab mixture. Tightly roll the rice paper over the filling and after the first roll (so that the mixture is covered), fold in both ends before proceeding to finish the rolling. Rest aside on a plate, making sure that the spring roll is not touching another spring roll. They will tear each other apart from sticking if you place them side by side. I found that they stuck well together (only one broke in the pan, but that was from over filling the rice paper). However, if you find they need some help at sticking the ends together mix a little flour with some water to form a paste and dab a little of this past at the end of the rice paper. I found a fellow blogger who has produced good step by step photos of the rolling if you care to take a look . Once you have rolled them all up they should look something like this. 5. Heat a deep pan with vegetable oil. You need to have enough oil so that the spring rolls can be submerged under the oil. Heat the oil to a high temperature and then turn down the heat so that it remains cooking at this low, but hot, heat. If you drop a crumb in the oil and it fizzes you know that the oil is hot enough. 6. 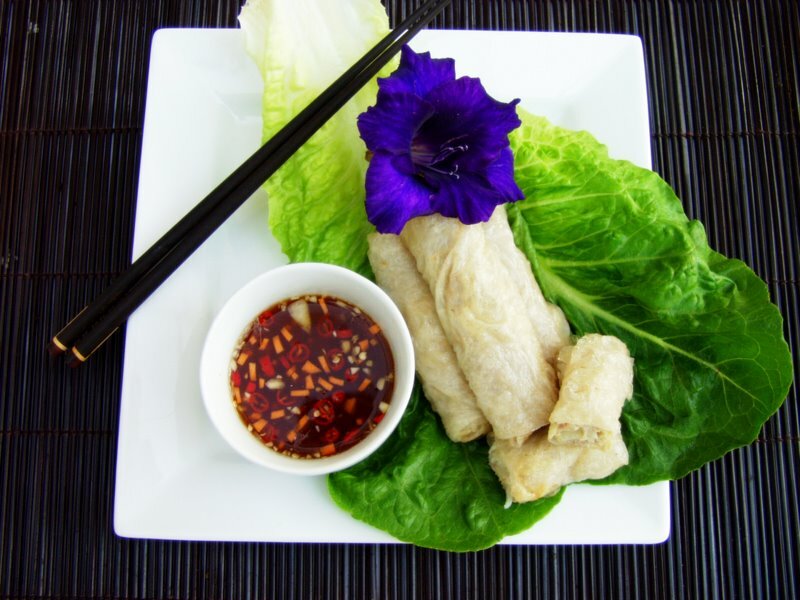 Place a couple of spring rolls in the oil at a time so that you can carefully monitor them. Turn them in the oil a couple of times. They should be well cooked through in 3-4 minutes. If you are going to use a steamer they will need 20 minutes cooking time. Please note they will not turn a golden colour like they do when you go out to a chinese restaurant. This is because they are using egg roll paper, which is different from rice paper. With rice paper they will go crispy BUT will remain with a white ish hue. Let them cool on kitchen roll, which will soak up the grease. 7. Serve with nuoc cham dipping sauce. If you are vegetarian these will taste really good with tofu as well, so give them a try. 1. Place all the ingredients in a jar with a lid on and give it a good shake. I could not source kohlrabi so simply omitted it and to really throw caution to the wind I added a tsp of soy sauce, apologies to all those purists out there, I could not resist. I also liked having a little chilli to spice things up a bit – sorry I can’t help it. I promise though that when I do a blog on game in the next month or so, I won’t be adding chilli! 2. Add additional sugar, salt, lime to taste. 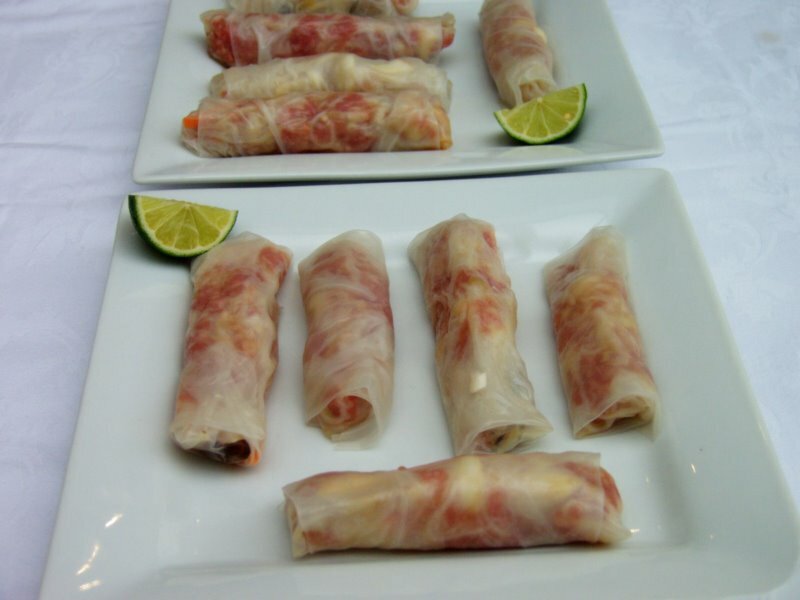 I hope you will love this gloriously sweet, salty, sour and spicy accompaniment for the spring rolls. I’d really like to hear how you get on so do post a comment. This entry was posted in Fish, Pork, Snacks and tagged cha gio, crab, nuoc cham, pork mince, rice paper, snacks, vietnamese spring rolls. Bookmark the permalink. I think these will be the first recipe!